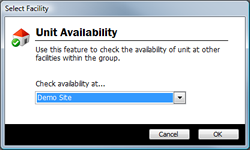 This function lets you check for available Units at other sites within your company / group. This ensures that the [potential] Customer remains within your company, as opposed to being asked to "find another company" if your site is full, or doesn't offer a Unit of the size that they require. During the below process you will be checking availability of units at another site. Find Unit Avail at Other Site can be found under the Central menu. Select the site you wish to search. 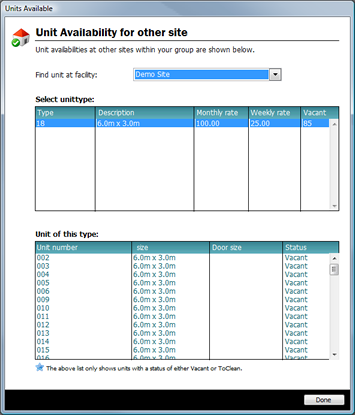 A new window will appear displaying all available Units (with a status of either 'Vacant' or 'To Clean') at that site. Select the 'Unit Type' at the top section of the screen to see any Units for that type in the lower section of the screen. The Unit number, size, door size and status is shown. Once you have informed your [potential] Customer of the information they need, click Done to return to the main Storman screen.